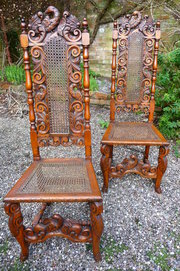 A pair of 17thc Walnut side chairs with magnificent eagles tops. Dating from the 1680s we are unsure of the country of origin,could be Anglo Dutch, German or even Italian?. In good condition with no repaired breaks, the seats show evidence of many old upholstery marks around the bergere caning which is now present. 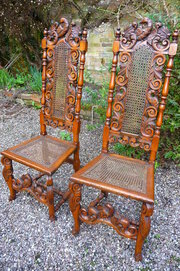 Standing tall these chairs measure 50" 1.27m high 15" 38cm deep,19" 48cm wide We actually have 6 of these chairs all in the same condition but feel most people will want a pair.